It is not often that I see a recipe and decide that I must make it then and there. 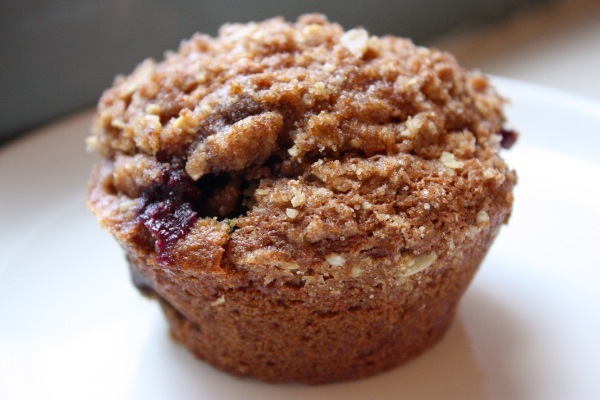 When I saw Mama Pea’s recipe for Vegan Blueberry Muffins with Streusel Topping, I knew I had to make them. That day. I absolutely love muffins, but I rarely make them because it is difficult for me not to eat 3 at a time! Anyone else have that problem? Anyway, Mother’s Day was coming upon us and I decided it was the perfect excuse to make a big batch of blueberry muffins to share with my awesome mother in law. These muffins are incredible. They are moist yet fluffy, and the topping adds a bit of sweet crunch that nicely balances out the sweet tart blueberries. I made only a few modifications to Mama Pea’s recipe, using ingredients I had in the house. I added some fresh lemon zest to bring out the blueberry flavor even more, real sugar and very little cinnamon, and almond milk as my milk of choice. Next time you want a muffin, don’t go to the bakery to buy one. Take out a bowl and spatula (no mixer needed) and make these blueberry muffins! Original recipe can be found on Peas and Thank You. YUM! mama pea rocks my face off with her vegan recipes…these definitely sound like a must-try! Yum, they look awesome. Her recipes are so great, I can’t wait for her cookbook to come out! Oh my these are yum! Wow Sabrina it looks delicious! I have the same problem when making muffins (or really, any baked good 🙂 ). I taste a little of the batter, eat one hot out the oven, another once they’re cooled off, and then of course I have to try one toasted… by the time I’m finished “testing” them, my batch of 12 is suddenly 6. I can only make them when I have people to serve! @Melissa Cari, Wow that is EXACTLY what I do- one out of oven, one when cooled, and one toasted ha! I do the same thing with muffins! I can’t stop myself and I think of them as more of a “snack” which gives me a reason to eat more! Plus, they start to taste less good as time goes by, so I always use that as a reason to finish them up quick. These muffins look amazing!! Must make those muffins NOW. They look awesome! I’m making these for sure, yum.